It was a warmer day yesterday; the air temperature was up to 4⁰C by mid-afternoon and the snow had that distinctly soft, mushy feel to it. In the morning we finished off some more camp tasks and after lunch Glenn reckoned we should all help complete the digging out the snow in front of the containers now that it was easier to deal with. A sound idea I thought. Feodor, Bill and Terry announced that it was highly important that they ‘test’ the river so that an accurate report could be sent back to UK to reassure all that there were indeed salmon here in the Varzuga. In these delicate situations it is best to try and keep all parties happy. So I went down to photograph our intrepid team ‘testing’ the Varzuga, and then hurried back, rather later than I should have, to help Glenn clear the snow. 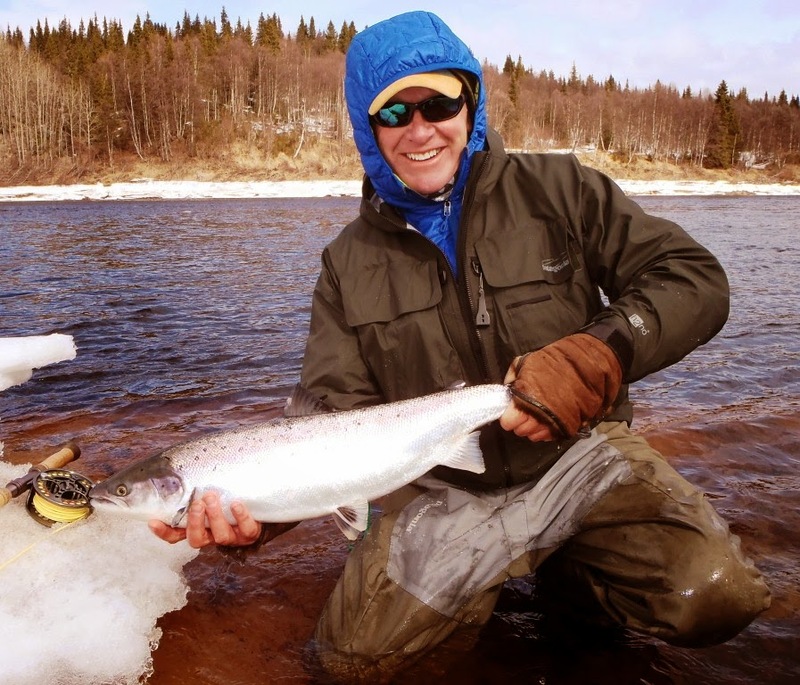 The river is incredibly low and shallow, all the melt is still frozen, but despite the water temperature of 1⁰C Feodor recommended only an intermediate tip and not too heavy a fly. Feodor led the way, quickly landing a couple of bright, silver spring salmon. Bill soon had one as well, uncoventionaly beached on a hung up ice berg mid-river - in these circumstances 'needs must'. 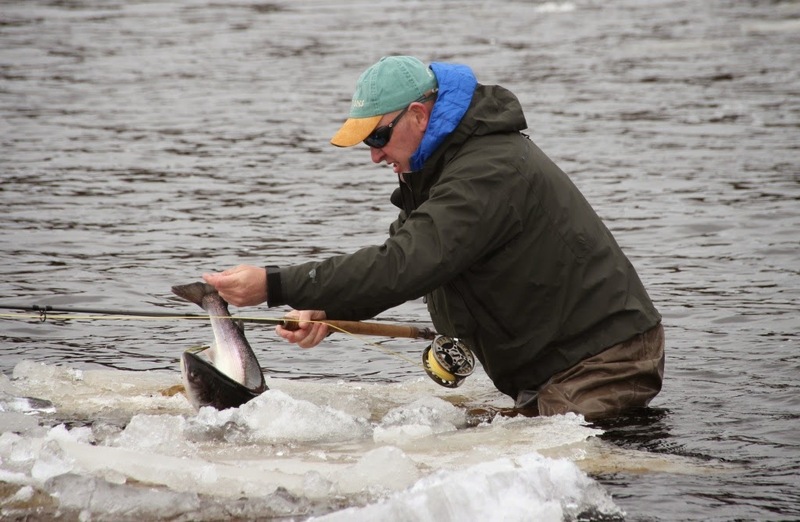 Terry had a few touches but nothing held on, so he put on 3" Monkey style fly and had a salmon try for it twice on the surface on the same swing – just why that fish, with the water temperature at 1⁰C, came to the surface so aggressively beats me. (For the non-believers we have it on HD Video). 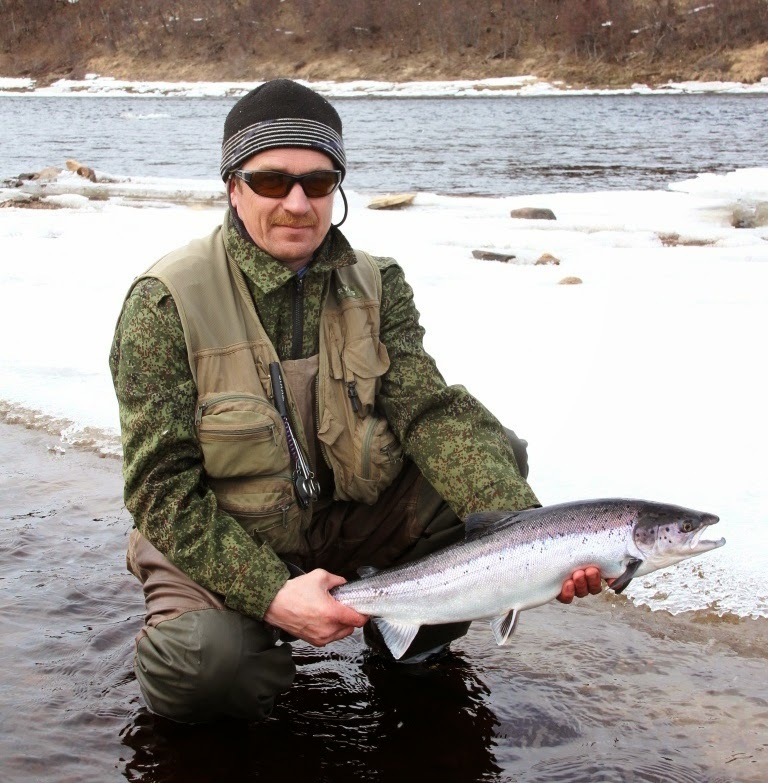 He changed back to a Willie Gunn and swiftly landed his first Varzuga salmon. 'Needs Must' in these conditions! We only have about 300 yards of fishable water at the moment, for those who know it - from Sharks Tooth Rock down to the two huge rocks where we park the boats in the lower water of June. And it is quite a dodgy scramble over the ice bergs to get at the river. Once in the river a sharp eye upstream is needed to watch out for the odd, large bits of ice that silently bear down on the unwary. I’m pleased to say that we have a gravad-lax on the go. Despite the water conditions just now, with such a late snow melt it is likely that those coming on 17 May will find higher and colder water than they might have experienced in the past. I suggest you make sure you have medium and/or fast sinking tips and a handful of heavier flies if needed – say fully dressed 1" brass tubes. Oh – I forgot to say – we can now fully open the container doors. Thank you Glenn.